Used in the common parlance of psychological discourse in Adler's day, the term antithetical mode of apperception entered Individual Psychology in association with the basic mistakes or interfering ideas of the life-style, commonly experienced as possibilities set in dialectical opposition, and weighing on the person as goals or imperatives. Adler used the phrase to identify the "sharply schematizing, strongly abstracting mode of apperception" of the neurotic as "something like the debit and credit sides of bookkeeping . . . and admits no degrees in between" (p. 248). Although Adler sometimes used the image of polar opposites, he was not considering a range of degrees of separation between positive and negative evaluations, as was common in the work of Fritz Perls and some others. For Adler, the antithetical mode of apperception was to be understood by analogy to the difference between heads and tails in the toss of a coin. This accounts for the exaggerated efforts of discouraged persons to preserve their self-esteem by claims to superiority, since in the neurotic logic failure to do so threatens a complete loss of human value or any claim to standing in the human community. Variations on the theme may insinuate (and attempt to disguise) claims to superiority by wrapping them in morbid expressions of penitence, remorse, guilt, and worthlessness (for example, by those contending for the position "chief of sinners"). The apperception-schema of the patient evaluates all impressions as if they were fundamental matters and dichotomizes them in a purposeful manner into above-below, victor-vanquished, masculine-feminine, nothing-everything, etc. (p. 333). The understanding of the world according to concrete pairs of opposites corresponds to the primitive attempts of the child to orient himself in the world and to safeguard himself. Among these pairs I have regularly found: (1) above-below and (2) masculine-feminine (p. 249). © Griffith, J., & Powers, R. L. (2007). The Lexicon of Adlerian Psychology: 106 terms Associated with the Individual Psychology of Alfred Adler (2nd ed.). Port Townsend, WA: Adlerian Psychology Associates (p. 5). This illustration provides a chart with examples of antithetical (either/or) thinking. These examples supplement the summation of the related concept antithetical mode of apperception. Used with permission by Jane Griffith. 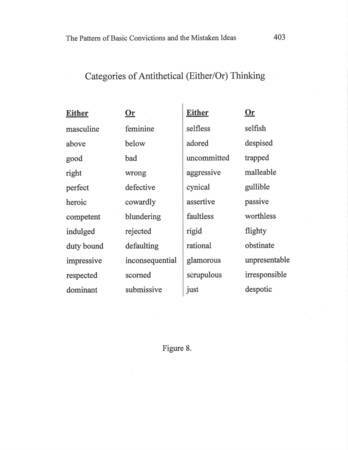 This illustration provides a chart with examples of antithetical (either/or) thinking. These examples supplement the summation of the related concept antithetical mode of apperception. This line of thinking sets up their understanding of the world according to "concrete pairs of opposites" as the examples indicate.